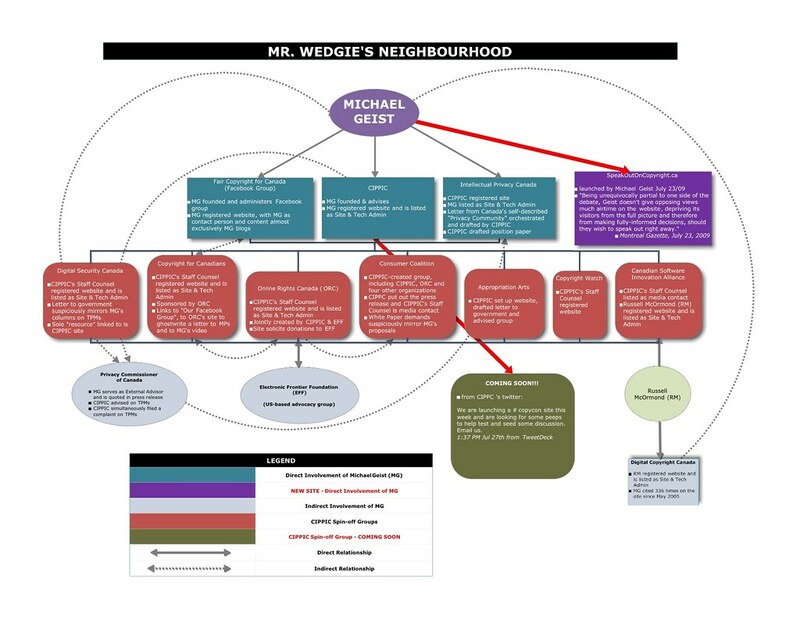 No one will be surprised to know that Michael Geist is leading the charge to sabotage artist rights around the world, this time in Brussels and soon in New Zealand. It is unclear exactly how he affords all this travel—wait, wait—could it be through untendered contracts or travel invoices approved by bureaucrats at Industry Canada? Wow. That would be a first. Which leads one to ask—where do all these ACTA leaks that Geist seems to know so much about originate? There are only so many sources, all of whom have signed non-disclosure agreements (that clearly are not being honored by someone). It seems that one plausible—or plausibly deniable—source would be someone in a party government with an axe to grind. Now who might that be? In related news—the American University has called for papers. On what topic you ask? What is the most weighty subject of the day, what is that without which the life of the common law must surely be exhausted? ACTA, of course–and not just ACTA, but also the Special 301 list–that would be the list that Canada just was placed on due to its extraordinarily poor IP enforcement. If you haven’t heard about either of these issues, you can read all about it on Geist’s various ramblings: “On June 16-17, 2010, American University Washington College of Law’s Program on Information Justice and Intellectual Property will host a workshop of scholars and advocates to assess the potential public interest impacts of the shift of international intellectual property norm setting to an enforcement agenda. This workshop will be followed by the launch of a working paper series on Public Interest Analysis of the International Intellectual Property Enforcement Agenda. The enforcement agenda includes the proposals for an Anticounterfeiting Trade Agreement (ACTA) at its center, but also includes other manifestations including the expansion of enforcement provisions in free trade agreements, seizures of drugs in Europe, broad “anticounterfeiting” national laws and bills such as that passed in Kenya and being considered in other African countries, pressure on countries through Special 301 and GSP benefit determinations, foreign aid and technical assistance directives, and other means. Now what is interesting about this? The Samuelson-Glushko Canadian Internet Policy and Public Interest Clinic, the Alcan of IP, the US-backed organization with a near 100% American board composition, has an affiliate company at American University, the Glushko-Samuelson Intellectual Property Law Clinic. Not the same as the Program on Information Justice and Intellectual Property, right? Faculty for Glushko-Samuelson: Peter Jaszi, Joshua D. Sarnoff, Victoria Philips. Faculty for PIJIP: Jaszi, Sarnoff, Philips. And PIJIP just happen to be focused on leaked documents published by Geist in their “call for papers”. This is what we call in the trade, bootstrapping: See ACTA Misreporting: Anatomy of a Smear. What passes for academia at its finest. See also: A handy chart of the contract matrix of payments by Industry Canada. Review of Parts of UK Digital Economy Act Untendered is the Prof: More secrets in the Geist closet?